A pair of tech giants with safer, faster-growing payouts for income investors to consider. It's rare to find a growing dividend in the tech sector, much less one with a payout like Qualcomm's (NASDAQ:QCOM) 4%, which is double the market's average yield. New HTC smartphones featuring Qualcomm's Snapdragon chips. Image source: Qualcomm. In exchange for that unusually generous yield, though, Qualcomm's dividend is saddled with a few key drawbacks, including a high payout ratio and a weak outlook for growth. As a result, income investors might prefer buying tech peers Intel (NASDAQ:INTC) or Cisco (NASDAQ:CSCO) right now. Chip titan Intel is suffering from some of the same negative industry trends that have pushed Qualcomm's results lower lately, but its diverse business is faring better than its mobile-focused rival. Big Blue's sales and profit ticked lower by 1% and 9%, respectively, in the last fiscal year, as gains in the Internet of Things and data center divisions mostly offset slumps in the PC-reliant segments. By contrast, Qualcomm's comparable figures dove by 5% and 12%. Thanks to that steadier growth profile, Intel's dividend boasts a key advantage over Qualcomm's in that it has more room to rise. Its $0.96-per-share payout last year was less than half of the $2.41 per share of earnings it generated. Qualcomm's payout ratio, meanwhile, soared to almost two-thirds of profit. INTC Payout Ratio (TTM) data by YCharts. 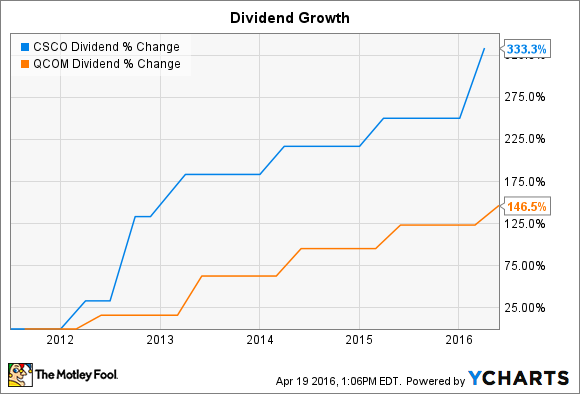 It's encouraging that Qualcomm is so committed to returning cash to shareholders through dividends. 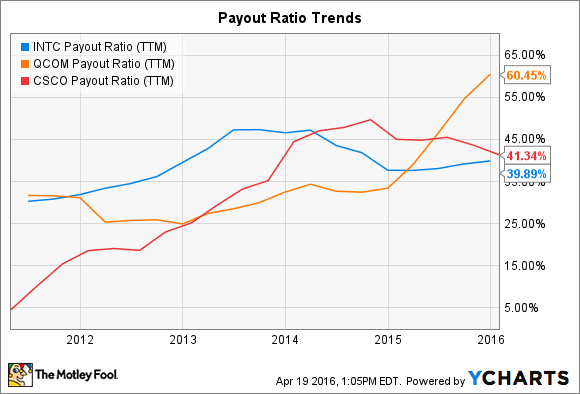 Yet its elevated payout ratio suggests future growth could be constrained, making Intel a more attractive option today. In its fiscal Q2 earnings announcement, Cisco posted steady sales growth and an encouraging 7% earnings boost. Thanks to its shift toward prioritizing software and recurring revenue, its profit margins are headed higher, which is taking some of the sting off stubbornly slow growth in the product side of the business. The results gave management enough confidence to boost the dividend by 24%. Stepping back further, Cisco's payout has more than tripled over the last five years, compared to Qualcomm's 130% gain. Importantly, that growth hasn't come at the expense of a dangerously high payout ratio, either: Cisco still pays out comfortably less than half of its earnings. Both Cisco's and Qualcomm's dividend outlooks are tied to cash generation: Cisco's management team has targeted delivering 50% of free cash flow as dividends while Qualcomm aims to return 75% of free cash through a mix of dividends and stock buybacks. A key contrast between the two approaches is that while Cisco has split its cash returns evenly between the two channels, Qualcomm's management team has recently favored share repurchase spending over dividends. Cisco and Intel are each valued at roughly 14 times the last 12 months of earnings. Qualcomm's valuation, meanwhile, has climbed to a 17 P/E multiple, which is relatively high compared to its average over the last few years. Qualcomm's stock also trails these two tech giants by requiring a higher premium with respect to expected earnings (15 times for Qualcomm vs. 14 times for Intel or Cisco). As a result, income investors might enjoy higher capital appreciation with either Cisco or Intel over the next few years, in addition to a faster-growing dividend.